Balikpapan, 25 November 2016 As a swift response to today's travel boom, Archipelago International is once again creating more signature experiences with the latest opening of its fourth property in Balikpapan, East Borneo. Becoming the first Hotel NEO in town, the new Hotel NEO Balikpapan joins Archipelago International's Aston Balikpapan, favehotel MT Haryono Balikpapan, and Quest Hotel Balikpapan. Jakarta, October 31st 2016 favehotels, Archipelago Internationals distinctive portfolio is proud to welcome two more properties to its portfolio. 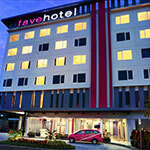 favehotels portfolio consists of 47 hotels nationwide, bringing the brand even closer to welcoming its 50th property. The recently opened hotels include favehotel Rungkut Surabaya and favehotel Sudirman Bojonegoro in East Java.